Tap water may look clean, but it may still contain potentially harmful contaminants. Chlorine is a type of disinfectant added to water to control microbes, yet harmful by-products can form from chlorine, such as total trihalomethanes (TTHMs). Depending on the geographic area, water can also be contaminated with everything from industrial and agricultural pollutants to heavy metals, sediments, and trace levels of pharmaceuticals. 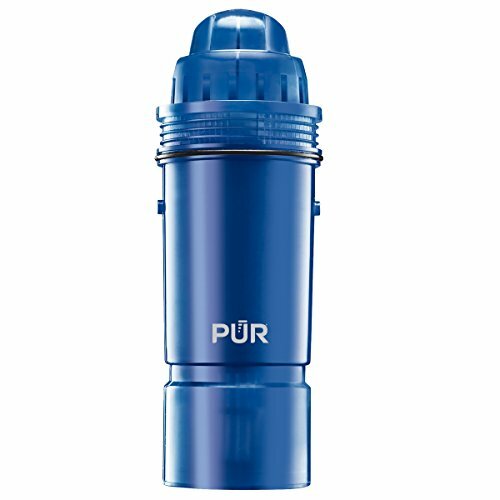 The PUR 2-Stage Water Pitcher Filter reduces lead, 99.9 percent of microbiological cysts (cryptosporidium and giardia), and can remove over 96% of trace levels of pharmaceuticals--all while retaining the beneficial fluoride in drinking water. The 2-Stage design has an activated carbon microfilter layer to reduce sediment, chlorine taste and odor, chlorination by-products like TTHMs, and agricultural and industrial pollutants. An additional layer is added to trap sediment. A single filter provides up to 40 gallons (1 to 2 months) of clean water, and should be replaced after this period. This replacement filter is meant for use only with the PUR 2-Stage Water Pitcher and Dispenser. PITCHER WATER FILTERS: PUR Basic Pitcher filters provide 40 gallons of filtered water, or 1-2 months of typical use, before you need a replacement. Only PUR pitcher filters are certified to reduce contaminants in PUR pitcher filter systems.